Buck joins our program from the Maine State Society for the Protection of Animals in Windham, Maine. He came to the MSSPA in December 2017 as a stallion, and according to Animal Control Officers had been living tied in a horse trailer along with a mare. While his companion was in such poor condition that she had to be humanely euthanized, Buck had at least been eating and needed only basic veterinary attention. As soon as the case was settled through the court system Buck was gelded, and thus far seems to be adjusting quite well. Buck came with a lot of tightness in his body (very understandable, considering his history) and has been receiving body work and treatment for ulcers. He connects nicely with a handler in the round pen, lunges well, ties, and stands quietly for grooming, bathing and the farrier. He currently wears front shoes for extra support. Buck is a confident guy who worked through all of our obstacles easily and is unfazed by sights and sounds around the farm. He is still easily distracted by the presence of mares, and can be a bit herd bound with his turnout buddies. 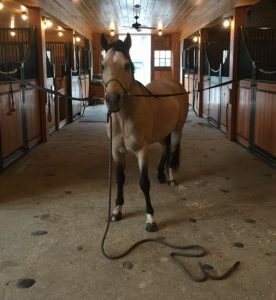 While he has done well out with other geldings, Buck can be pushy and wants to be in charge, so we currently have him paired with another strong-willed gelding who can keep him in line. Buck has been working well under saddle both in the arenas and out on the trail. He has been on several off-property outings, and handled the change of scenery very well. His biggest challenge is on staying focused when there are other horses working with him. This is a quality horse with a lot of potential, and we look forward to continuing with his training. UPDATE: We are thrilled to report that in early January of 2019, Buck found his forever home! 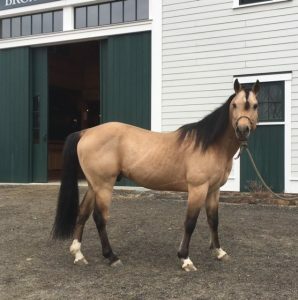 He will be working as a lead trail horse near Mt Washington in New Hampshire, and his new owner looks forward to exploring the National Forest together on their days off. We could not be more excited for Buck's new life, and wish him and Brittney many happy trails. Congratulations!